Recorded live on the Mount of Olives in the classroom at the Jerusalem House of Prayer For All Nations! Experience the angelic sounds of harp music played and sung by the students of the 2nd Jerusalem School of the Prophetic Harp. Led by international harp instructor and psalmist, Michael-David, you will hear the songs that were recorded live in the classroom after a month of instruction at the Jerusalem House of Prayer For All Nations. The resurgence of the harp is a part of the restoration of the Tabernacle of David as the teaching of the Davidic Harp brings a new but ancient sound back to the heavenlies. This CD is accompanied by a bonus DVD that gives you a look into some of the exciting activities of the school. 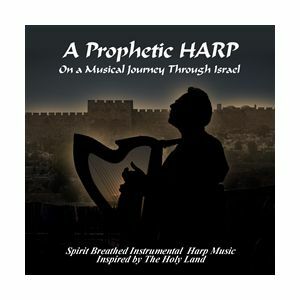 The DVD features highlights from a gathering of 24 prophetic harpists from previous schools as they played for the 2011 All Nations Convocation in Jerusalem. I just got back from Jerusalem. To be there was like being under an open Heaven! Imagine the angelic sound of a group of prophetic harpists worshiping on the Mount of Olives at the Jerusalem House of Prayer for All Nations where there has been continuous praise and intercession for over 24 years. I wish you could have been there with me and shared in this spiritual experience. We had divine encounters as I gave instruction to harpists from all over the world in playing the harp as King David played and releasing the prophetic song. Waves of God's presence brought inner healing and deliverance to the lives of those who were present. For the first time since the 2nd Temple, 24 Prophetic Harpists worshiped together in Jerusalem! 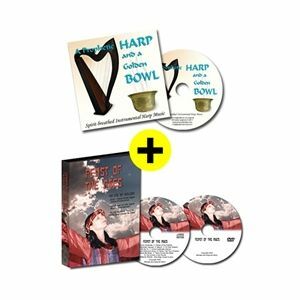 As an added bonus, along with the CD, I want you to have a gift from me û a DVD that gives you a behind the scenes look into the exciting activities of past Schools of the Prophetic Harp. The DVD features highlights from a gathering of 24 international harpists from around the world who opened the 2011 All Nations Convocation, put on by Jerusalem House of Prayer for All Nations. Not since the time of the Second Temple has there been a gathering of 24 prophetic harpists in Jerusalem! "Click here to hear samples of the CD. All the songs were composed specifically for the School of the Prophetic Harp with the intent of providing music that would have beautiful layers of harmony and chord structures that would work well with a large group of musicians. You'll find that the songs lead easily into spontaneous worship! û a key element in the instruction at the school. When you purchase the CD, a link to our website will be provided inside the cover artwork that will give you access to PDF's of the sheet music or chord charts to the songs on the CD. 11. Here I Am In Yerushalayim (5:37) Original music by Michael-David and his wife Zsiporah"